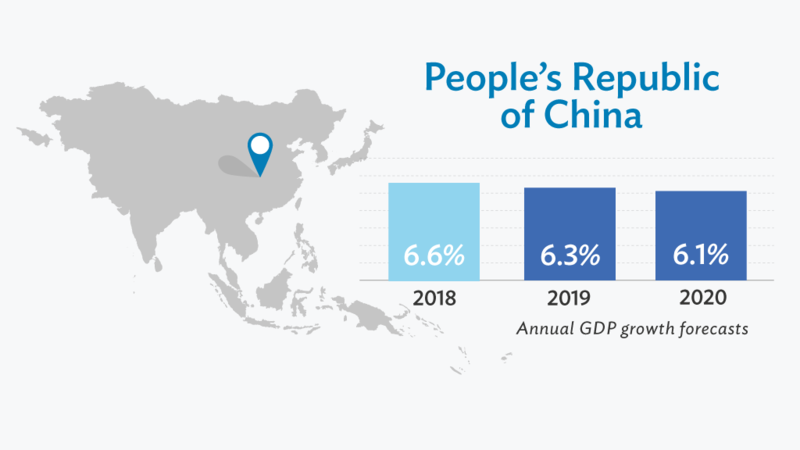 HONG KONG, CHINA (3 April 2019) — Growth in the People’s Republic of China (PRC) is expected to moderate in the next two years as global growth slows and trade tensions with the United States (US) weigh on trade and investment, according to the Asian Development Bank (ADB). In its Asian Development Outlook (ADO) 2019, ADB projects gross domestic product (GDP) growth for the world’s second largest economy to slow to 6.3% in 2019 and 6.1% in 2020. That is below the 6.6% growth rate recorded last year. ADO is ADB’s flagship annual economic publication. The main risk to the PRC’s growth outlook is the possible intensification of the trade conflict with the US, which would damage investor and consumer sentiment. Domestic downside risks include policymakers seeing measures to stabilize growth as insufficient, abandoning efforts to stabilize local lending, or loosening restrictions on shadow banking, and allowing debt from nonbank financing to balloon. The report discusses the need to reform social security contributions as a key policy challenge for the PRC. To address this, the report recommends that the government tackle underreporting of pension contributions, inefficient collection of social security contributions, and legacy costs from obligations to retirees who became eligible for state pensions when the pension system was modified in 1997. Consumption will remain the main driver of growth in the PRC in coming years, although it is expected to slow slightly as household income growth declines. A gradual loosening of local housing market restrictions in 2019, however, will boost property-related consumer spending and support retail sales in the latter part of this year and the next. In 2018, consumption contributed 5.0 percentage points to the country’s GDP, while household consumption expenditure grew by 6.2%. The outlook for the PRC’s labor market is less robust. ADO 2019 notes that slower consumption and foreign investment as a result of ongoing trade tensions will dampen demand for low-skilled and blue-collar workers. The unemployment rate in the country edged up to 5.3% in February 2019 from 4.9% in December 2018. Consumer price inflation will remain benign at 1.9% in 2019 and 1.8% in 2020 on the back of declining domestic growth, lower global oil prices, a stable Chinese renminbi against the US dollar, and sharply lower producer prices. The PRC government’s monetary policy is expected to become more accommodative in 2019, with the central bank continuing to cut the bank reserve requirements ratio. An expansionary stance towards fiscal policy, which started in the second half of 2018, will also continue this year.